KIDS FOR KIDS lends goats to a family for 2 years – providing milk for the children, and forming the nucleus of a little flock. Due to the high cost of Billy goats in Darfur, our Goat Loan will currently provide each family with 5 Nanny goats, and a shared Billy goat with 2 other families. Beneficiaries agree not to sell the KIDS FOR KIDS goats and they sign an undertaking to care for them in trust – but the kids are theirs. After 2 years they pass on first born offspring to another family in need. And so on. Donating even one little goat makes an enormous difference because its offspring will go to another family, and another. Donating a Goat Loan will help lift entire families out of poverty. Q. How long do Desert Goats live? Q. Do you know how to tell a sheep from a goat? A goat’s tail sticks up! A sign of optimism perhaps? Q. Are goats suitable for desert life? Goats only drink every two days in hard times – which makes them viable when water is scarce. Local goats are hardy, essential when the temperatures soar in the summer to over 150 degrees. Q. What do goats eat? Anything! Which is why they can survive when nothing much is growing. But to prevent them from destroying the landscape the children keep them closely herded and all “fields” are surrounded by thorn hedges to keep them safe. Q. What colour are they? They are multi-coloured, sometimes black, sometimes white, but usually a mixture of chestnut, browns and blacks. Rugs made of goat hair are these natural colours. Q. Who looks after the goats? 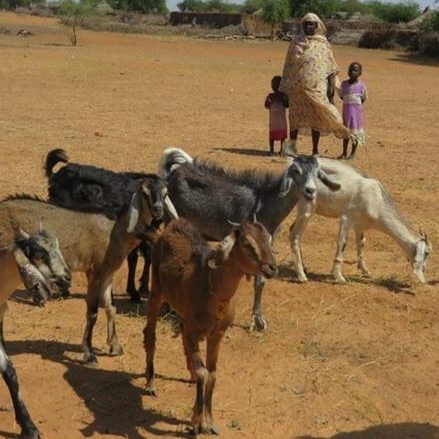 It is usually the children you see tending the goats and helping them to find food so families prosper if the children do a good job – education is a priority in Sudan, the success of the goats means that they can pay for schooling. When the children are at school mothers care for the animals. We now have Children’s Shepherd Committee as the children care for the goats after school – they are often the first to notice if a goat is sick. They inspect all the Kids for Kids goats in all of our 92 villages every Friday – which in Sudan is the first day of the weekend! Q. Why is goats milk important? It is full of vitamins – A, which prevents blindness, B, B+, C, D, E, potassium, magnesium, folic acid and is rich in carbohydrates, calcium and protein. Particularly in times of drought, as now, it is the only source of these vital elements to keep children healthy. Any excess milk is sold. Often the price of a sack of millet is talked about in the number of goats it is worth. You can even find the price of goats in Darfur on the internet! Q. How are the KIDS FOR KIDS goats surviving now? The news is good – the grazing returned this year and most of our nanny goats had twins. In 2010 goats in some areas died because people had not been able to store sufficient hay for the hungry months, when the harvest failed. One lady had 19 goats after just 10 months. This meant she not only had milk for her own children, she could sell some and was able to sell one or two of the male kids to provide essentials for her family.